The newspaper company I worked for in Dundee latterly had two sites for reporters - one in a location on Kingsway East outwith the city centre and the other in the old, original publishing building known as Meadowside that we used when covering events actually taking place in the town centre. Meadowside, more properly called The Courier Building, was opened in 1906 and followed the style of many US publishing firms' HQs of the time. When I joined the company in 1979, the 20-odd reporters were housed in a fourth-floor room probably not much bigger than about 20 ft by 15 ft. My main recollections of it now are of the smoke-filled atmosphere and the clatter of typewriters. In the early '80s, the reporters moved from Meadowside to an office in one of the company's other buildings in Bank Street just a few hundred yards away (now a shopping centre car park) and then in the late '80s moved out to the Kingsway East print works. The office that is the subject of the pic in this post was a small room with a few computer terminals that, as I mentioned earlier, served as the reporters' sole base when in the city centre. I think I'd been on court duty the day the photo was taken and, since I was going through a street photography phase at the time, had a wee Olympus XA2 with a roll of XP2 in it strapped to my belt. Judging by the light, I must have taken this during my lunch break. 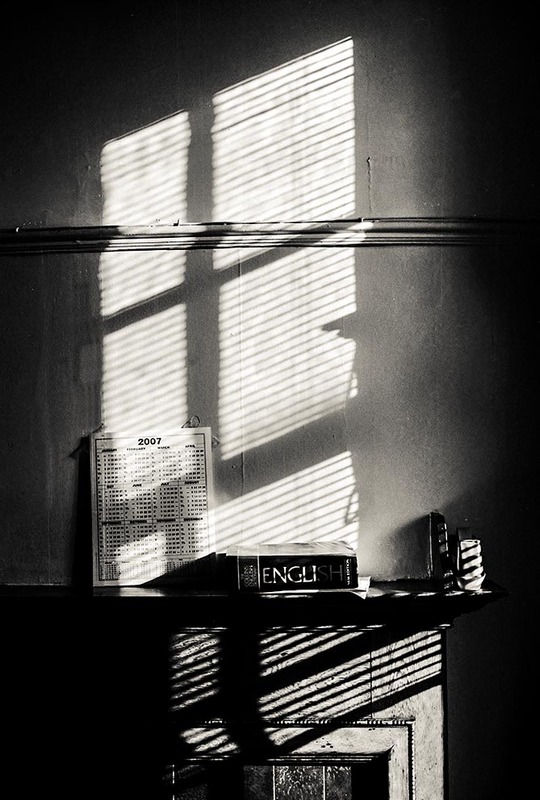 I loved the sunlight pouring through the venetian blinds and casting the striped shadow on the wall. The scene was exactly as I saw it although I seem to remember the calendar was already a couple of years out of date! You can see a fireplace at the bottom of the shot. Back in the early and middle part of the 20th century, open fires were used throughout the building as the main source of heating. Spell checkers meant the the once obligatory dictionary, sitting on the mantelpiece, saw very little use around the time I took the photograph. I've tried printing this neg in the past to show detail in the shadows - it's all there - but I've never managed to produce anything that I liked. Then I wondered to myself how the Gibson treatment would suit this shot so I scanned the negative and "did a Ralph". The result is actually the first image from this negative that I've felt captured the scene properly. Now I just have to do a print. He's definitely onto something this Gibson fellow, whoever he is. 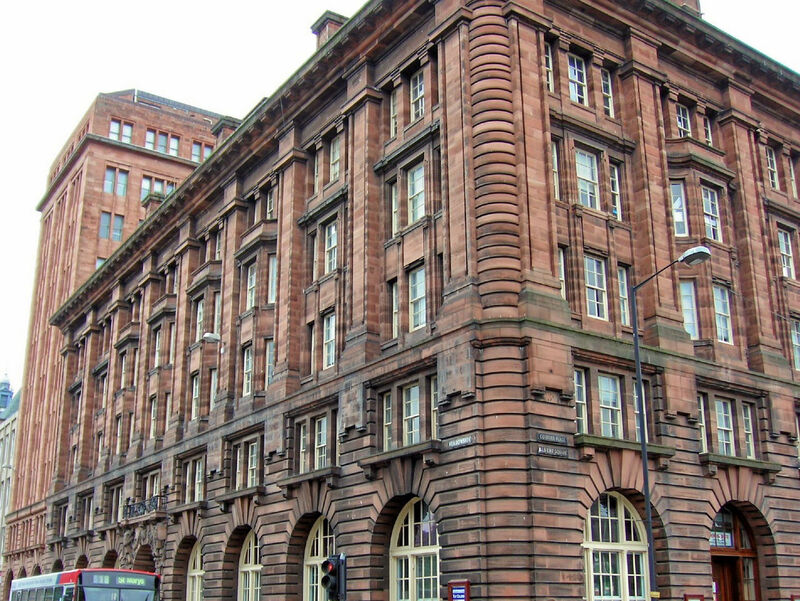 Addendum: The Courier Building, which had lots of small rooms throughout its five atmospheric floors with much old, dark wood and brass fittings on show, is now going to be modernised by a new bunch of directors who epitomise the type who know the price of everything and the value of nothing. More than a century of publishing history will be swept aside to be replaced by smoked glass, light wood, a glazed directors' suite on the fifth floor offering panoramic views of the city and solar panels on the roof. Yet more corporate vandalism and another piece of the city's history flushed down the toilet. the modernisation is underway Bruce - scaffolding has been up for over a year!